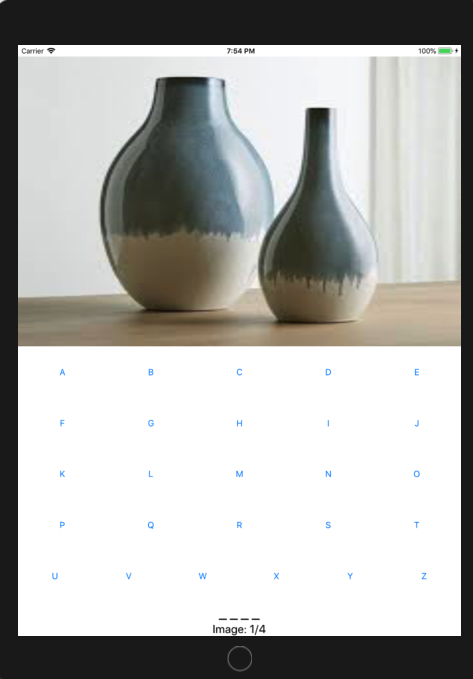 This is an app wherein you have to find the word that represents the image. It's the same concept as the course app but I did this one myself. How can I improve this code (put more commentary, put more space, you can add that, etc.)? I finished the second part of app development with Swift. Please explain why I should do the modification. Commentary are in French but I can translate them. @IBOutlet weak var wordLabel: UILabel! @IBOutlet weak var scoreLabel: UILabel! let letter = sender.title(for: .normal)! I would begin with the imports. When importing UIKit you will not need to import Foundation because the contents of UIKit will also include Foundation. Now to recommend a few things with regards to the Game struct. Now the way the struct is instantiated means that one image is equivalent to a "Game," so you would be able to set the correctWord, and image to constants with let. Secondly, we can also provide a more descriptive names for the variables to eliminate any confusion later on down the line, like using guessedLetters instead of guessedLetter (plural indicates that this is likely an array), correctAnswer instead of correctWord, and guessedWord instead of formatedWord as these are more clear and descriptive of their purposes. Now with regards to the View Controller. I would begin by dealing with the variables at the top of the controller. These should either be included in the controller or refactored into their own file. For simplicity sake, I'll just move these to be part of the ViewController. Next we would want to rename some of the variables to make their purposes more clear. This will help with understanding of what everything does in a way that is more identifiable than comments. I've opted to use names like imageDictionary and currentGameIndex over imageAndWord and imageFindNumber, for example. Next, there are a couple values that are unnecessary. Particularly theKey, theValue, and totalKey. These are not needed because we already have a mutable dictionary that we can perform actions against, so we do not need to create extra versions of these values. When we are setting the new game parameters, I've updated those references to use the following logic, which will do the same thing without needing additional arrays. I've introduced a guard statement in the newRound method. This statement is useful for when you have a dependency that you need to continue executing. In this case, you need to have an image available in order to proceed, so the guard case will verify if there is one, and then continue through or terminate early. This is not necessary, but in cases where there are dependencies that are required, it can be useful and easier to read than nested if statements. Another change I would recommend is renaming the enableOrNotButton: method. In my example, I've updated it to setButtonStatus enabled: as it helps you understand at a glance what the intent is. setButtonStatus(enabled:true) shows you that you are intending that the button will be updated to enable = true. Finally I've removed the redundant comments, as those don't really help much of anything. If the method is named appropriately, as is the case for updateUI(), then you don't really need a comment that says "updateUI() will update the UI". Comments are more helpful when they explain something that isn't understood. A good comment should be able to answer a question or provide information that isn't immediately obvious. // Disable the button so the user cannot select the letter again. let guessedLetter = sender.title(for: .normal)!